Hello, who’s a clever Kitty? 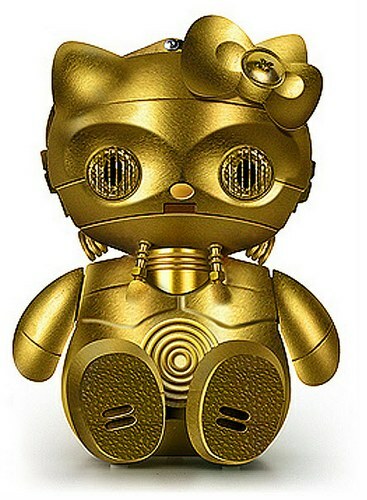 What do you get when you cross Hello Kitty with Star Wars? Lots of fun for Hello Kitty fans. I have pretty much come to the conclusion that Hello Kitty fans are a breed unto themselves. They are also a devoted bunch who like to see the world’s cutest cat on everything (if you don’t believe me, check out our previous Hello Kitty posts). So why not give pop culture icons the Hello Kitty treatment? Illustrator Joseph Senior has been busy in Photoshop creating Hello Kitty mash-ups with all sorts of well known characters – no one is safe! Star Wars, Toy Story, Smurfs, heavy rockers Kiss and Strawberry Shortcake have all been ‘Hello-Kitty-fied’ by Senior, to name just a few. Head over to Senior’s flickr page and check out his fab Hello Kitty creations. He plans to create one hundred-and-one kitties and turn them into a coffee table book – just the sort of thing Hello Kitty fans will snap up.